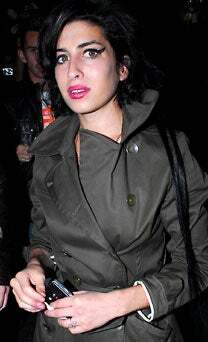 Another day, another Amy Winehouse health horror! We love the Brits for always zooming in on Amy's ailments. In today's Daily Mail, it's a "throbbing finger." Dr. Jezebel — with the invaluable help of colleagues at WebMD's symptom checker — is on the case. After the jump, see the patient and our non-expert diagnosis. Okay, after selecting "fingers" as our target area, we're faced with 32 possible symptoms, including "black colored skin," "involuntary movements" "visible deformity" and "unusually short forth(sic) fingers." Uh, we're going to go with "swelling." The symptom checker wants to know if the swelling is "better with ice" or "better with rest" but somehow we think the only ice Amy sees is in her cocktail, does that count? Anyway, swelling could be due to 17 possible conditions, from gout and insect stings to CREST syndrome. We rule out angioedema (also known as hives), lupus and poison ivy. pseudogout sounds fun, but doubtful. But hey, what's paronychia? An infection that develops along the edge of the fingernail or toenail is called a paronychia (pear-ah-NIK-ee-ah). It is the most common hand infection and, if left untreated, can progress to a more severe infection of the entire finger or toe. Uh-oh Amy! You're infected! Luckily, WebMD offers a "Self-Care At Home" section. Care at home includes warm soaks in a mixture of 50% warm water and 50% liquid antibacterial soap 3-4 times daily for about 15 minutes. This soaking should be done at the first sign of redness around the nail. Your doctor will most likely use medicine (such as lidocaine) to numb the entire finger first and then will open the abscess using a surgical knife (scalpel). In extreme cases, infection can move under the fingernail and need partial or complete nail removal. Unless there is an extensive cellulitis (inflammation and infection of the soft tissue around the nail), antibiotics are usually not necessary. Dearest Amy: Pick up some antibacterial soap and start soaking in it. And maybe scrub the hubby while you're at it? Earlier: Oh No: Does Amy Winehouse Have Syphilis? What's That Lump In Amy Winehouse's Armpit? Paging Dr. Jezebel... Amy Winehouse Needs Us, STAT!